Rotten Tomatoes is no longer allowing people to post comments about films before they come out, to try to stop trolling. The site announced the change in a blog post, saying some comments are "a disservice to our general readership". It says there's been "an uptick in non-constructive input, sometimes bordering on trolling". But the movie site assured fans they would still be able to review films once they're released. "We have decided that turning off this feature for now is the best course of action," the blog said. "Audiences can leave a user rating and comments as they always have." The comments feature isn't the only thing being changed. "As of February 25, we will no longer show the 'Want to See' percentage score for a movie during its pre-release period," the blog said. "Why you might ask? We've found that the 'Want to See' percentage score is often times confused with the 'Audience Score' percentage number." 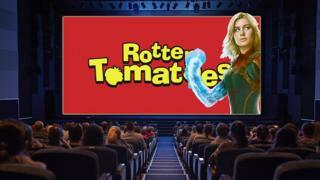 Rotten Tomatoes says the changes will "refresh and modernise" its Audience Rating System. "We're doing it to more accurately and authentically represent the voice of fans, while protecting our data and public forums." The Audience Score is only shown once a film or TV show is released. The changes come after claims that some fans tried to down-vote Captain Marvel before its release date on 8 March. The movie is the first Marvel film to have a female star as its sole lead in more than a decade of the Marvel Cinematic Universe, which started with Iron Man in 2008. The president of Fandango - which owns Rotten Tomatoes - Paul Yanover, told CNET they didn't change the site to protect Captain Marvel but that some adjustments were aimed to achieve what he called "noise reduction - when high-profile films such as Captain Marvel or Star Wars movies attract trolls with agendas". He said: "As a whole, these changes are part of a long-term site strategy". Marvel's next big thing: Who could follow The Avengers' cinema success?